Shift gears, find higher ground. Today, a friend in Calgary texted me and a couple of friends a link to a commentary in a major Canadian newspaper, headlined "Ban the Bike!". We've had a group text thread going for a few years now — four old friends from our university days, sharing podcast and movie recommendations, our personal pain, rude animated gifs, and the occasional rant. Today was my turn (for a rant), and it was about that opinion piece he sent. I won't link to it out of a bilious distaste for the right wing rag, the writer (a noted climate change denier), and the execrable article itself. It all made me angry, and I don't want any of it to get more attention that it may have already received in the past 24 hours. What do I think? What do you think I think?!? You know I worked in cycling advocacy. You know this is my world. And because this article is in a right-wing rag, written by someone whose life's work is offensive to me, containing ideas that fly in the face of what every progressive government in Canada is doing for active transportation, from the major metropolitan regions to medium cities to small towns. Of course I think it's shite. And then I realized it...he knows all that. He knows who I am, what's going on in the world, and the provenance of that piece (ie. special interests). He didn't send it to me to insult me. He, like perhaps millions of others, read the piece and was simply taken in. As he admitted, "My world is pretty insular at times. I like to have my mind changed by good information." Still, I didn't respond at first with good information. Remember, I was angry, and this is texting, so in reality he just sent it to me ten seconds ago, and I'm still angry. Especially because he pre-empted it with, "I'm not anti-bike..." No "but" (thank god). Still, I lay into him a bit. Congrats, you just became a stereotype — high income middle-aged white male in oil country shares error-filled anti-cycling screed. I would have to send you about 10 or 20 references that combat the misinformation in that piece line by line. It’s not worth my time. The information is out there, if you’re interested you can look. Oh yeah, I went there. But seriously — the article was horrible. And there are probably, literally, over 100 English-language articles, blog posts, research papers and testimonials that speak to the experiences of communities, cities and entire nations in the late 20th and early 21st century that would provide contrasting, evidence-based information to combat the stupid article. So no, I wasn't going to do it, and yes I did feel a little better. This is just a one sided opinion piece from a shill- I know that. I'm just interested in the social aspect. How does a single person vehicle (a bike) become a social interaction? Is there an article you can send me about the positive social implications of biking? Wait — what? Did you say...social interactions? Positive social implications? OK. Now we're talking. I had to hold myself back from just texting him this website, my website. Well, OK I did eventually share my website with him, but hold that thought. First, I backed down because I really fell back in love with old Tony. Because it's a beautiful question. I told him that if he really wants an answer, he has to understand that sharing that horrible right-wing op-ed might never have provoked this part of the conversation. The one we should be having about bikes. Is it true cyclists don’t pay their fair share? Is it possible that the detriments of breathing the outside air while cycling outweigh the benefits of cycling? Why is London such a bad place for both cycling and driving, and how did it get that way? How can car parking be both a money both a money loser and economically important to our cities? What happens when you add road capacity for vehicles — does it reduce or increase congestion? "I think you could and probably should look into all that." I said. Then I returned to his real question. Read FrostBike by Calgary herald writer Tom Babin, I told him. Because, first things first —transportation is about location. And it's a great book by a local person about local issues— like bikes in your hood, all of that old time conservatism, oil, and snow. Then I recommended he visit my website. OK, I know self-promotion is often incongruous with public service, but this website, while on the surface about transportation policy, politics, engineering and volunteerism, is really all about THAT. My intention with this website (and ultimately the book to come) is to turn the memories of a few hundred people from the past 30 years into a living narrative about the spirit of cycling. 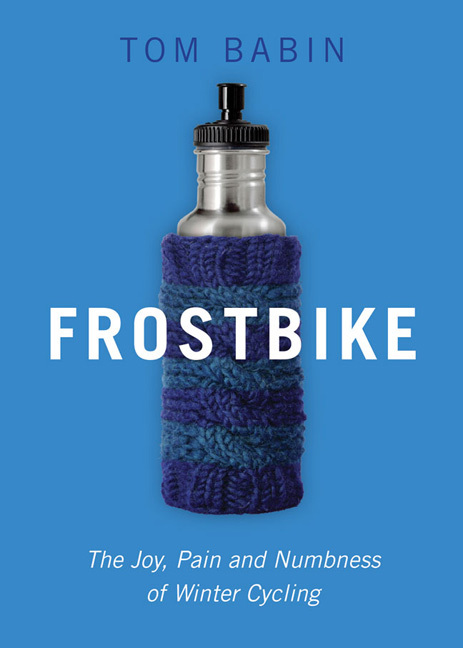 Their words and work explain why bikes and cycling are cool, and good, and fun, and healthy. And how cycling transforms people's lives, without question and without exception (anecdotally, of course). I've benefited from their work. Just talking to them has changed my outlook, my language, my feelings about this lonely, beautiful, energizing and exhilarating activity. It's because of this reminder of what cycling is all about that I felt I could even begin to answer Tony's true question — how does a single person vehicle become a social activity? I ultimately answered it the only way I could — by trying to describe that moment when riding a bicycle changes from transportation to lifestyle. When, at every single stop, there's a friendly stranger for me to talk to. When two cyclists approach each other, mouths hanging open like happy dogs, and smile and give each other a little 'hi'. When I see a friend on a route, and I can stop and chat with them. These are all things you cannot do from behind the wheel and windshield of a vehicle. There may be other ways to win an argument about bikes. But I'm just not interested anymore. © Colin Stein 2019. Portrait photography by Jennifer Friesen and David Niddrie.